Cargo Area Security Covers for the Jeep Liberty provide peace of mind by placing valuables out of sight. Durable, long lasting fabric blocks UV rays and hides cargo contents from view. Cover retracts out of the way when not needed. Available in colors that match vehicle's interior. Same as O.E. Please select year and color above. 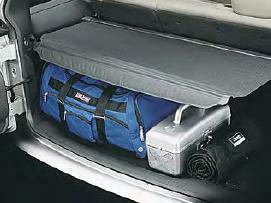 *For 2002-2003 Models Built Before 9/4/2002 no Cargo Area Security Cover is available. I love it. It fits perfect. Bought this for my son's Jeep Liberty and it fits perfectly! We just ordered a JLUR and will definitely look to Just For Jeeps for accessories! It's so nice to be able to conceal my valuables NOW, instead of using jackets and other stuff when I go in places! Found the cargo area security cover on the website, ordered it and received it. Easy peasy and no problems. Success! ProsEverything was easy and good. Great OEM product at a great price. Quick shipping! This is an OEM product so it fits, matches, and works perfectly. Great price at Just for Jeeps and quick shipping. Looked all over the web for a replacement for my car. Every place was expensive and then I found JFJ. Once I saw it was all MOPAR associated my fears were fears were gone..... JFJ will see me again. item was priced better than anywhere else and arrived quicker than expected. Also, I had mistakenly ordered the wrong color, but received a telephone call pointing out my error so I was able to make the change without the hassle of back and forth shipping. Very Pleased!